It’s here. The day you have anticipated, dreamed about and maybe even dreaded for 18 years has arrived. 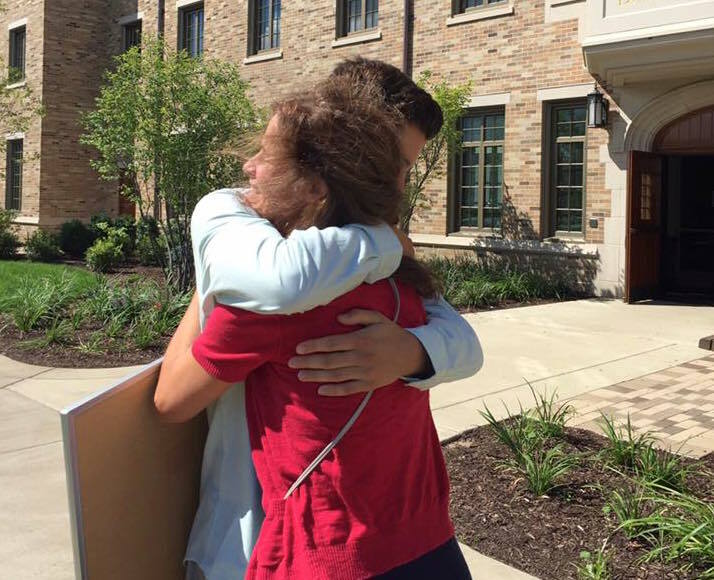 While college move-in day is a proud moment for any parent, that does not mean it isn’t a day filled with stress and more than a little sadness. While we have written about why we will miss our kids, how to manage dorm shopping and how to be successful in college, here we are just going to look at the logistics of getting our kids out of our homes and into their new apartment or dorm. 1. How are you getting to campus? Are you close enough to drive to your teen’s new college? Can you fit everything into your car or will you want to ship some of the bedding or bulkier items? Do you plan to fly and have you looked into how expensive it is for each checked bag? If you still have dorm shopping to do, take a close look at what stores like Bed, Bath & Beyond, Target or The Container Store will do to ship for free. On move-in day you will have an even better idea of what is needed for your teen’s room and you can go to the local store where your items will be set aside for you. No hauling. No paying for shipping (the service is free.) No buying and returning. No going to the store only to find out they have run out of what you need. Find out where your student picks up her swipe card/key/ID card. Don’t unload her belongings only to discover that you cannot get into the building and key pick up is across campus. Will there be student helpers with move-in? At many schools older students are waiting to lend a hand. Is there an elevator in the building or will you be walking up flights of stairs? Where is the closest parking and is there a time limit on how long you can keep your car there? Check the college website to see if there is any parent programming on move-in weekend and what time it begins. Check online what the rental costs are at the university for items like mini refrigerators and microwaves if you are deciding between buying and renting. Would a small pushcart help this move-in (and move-out)? Your freshman will move more frequently during the next four years than you can ever imagine and this is unlikely to be the last one she needs your help with. Make sure you and your teen have read the list of forbidden dorm items and what can and cannot be hung on dorm room walls. Get Bed Bath & Beyond School Info Pages detailing what your school provides, what’s not allowed, and what you should bring (available in-store and online). Don’t take all of the luggage home. They will be returning at fall break or Thanksgiving. Leave a small bag for travel. Move-in day in many parts of the country can be sweltering, so come prepared with some cold drinks and snacks. The parents who show up with coffees, bagels or doughnuts cannot help but win over a few fans. Wear clothing that is both comfortable and can get dirty. Forget the cute white jeans! Dorms can be filthy even on move-in day. Family weekend is a better time to bring the extended family. Dorm rooms are small, hot and strewn with packing debris. There is no place for family members to sit and your child barely knows their school. They will have far more to show and tell grandparents and siblings by October. Bring a doorstop – it will make move-in much easier and your kid will use it as a way to keep the door open to meet their hall mates in the first weeks of school. When you get to campus your kid’s dorm will be crowded. Their hall will be filled with empty cardboard boxes and their room will be covered with their roommate’s belongings. The more you organize your packing ahead of time, the easier it will be to unpack upon arrival. 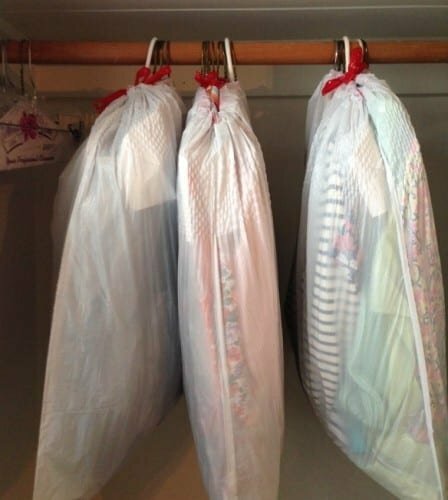 Pack hanging items on their hangers in tall garbage bags (as shown below). That way putting them in the closet is as simple as tearing away the bags. No wrinkles, no packing hangers and no suitcases required. Pack bedding all in one place (duffel bag or, even better, large black garbage bags) so that it can easily be accessed all at once. It is best to wash it before you leave home. Get rid of as much packing material as possible at home. The dorm will be piled high with cardboard boxes and plastic wrapping and the trashcans overflowing. Pack the underbed storage containers with the items your student will keep in them during the year. Bulky sweaters and extra sheets and towels are often good items. Use one storage drawer as a “medicine cabinet” with extra toiletries and over-the-counter remedies. Tape the drawers shut before you leave for move-in. Make your child’s bed. It is a timeworn parental prerogative and completes the circle from when you first made their crib. Tell them why it makes sense to put underwear in the top drawer and sweaters in the bottom but then step back and repeat to yourself, “This is not my room. I am not going to live here. This is not my room. I am not going to live here,” as many times as necessary. Take away anything they doesn’t think they will use. Bring heavy winter things to family weekend that usually takes place in the fall or let they return with them after fall break. Slip a letter or short note with words of love and good luck into something that you are not going to unpack. Have a hard stop, the hour that you are going to walk away and leave they to begin their new life. Like taking off a Band-Aid, saying goodbye may need to be done quickly. Think about college move-in day before it happens, it will take you by surprise. All the tears you may have shed in the previous weeks won’t save you from today. Know in advance how you want to say goodbye. Plan for your final alone time before you reach campus, even if it is a quick family meal at a roadside diner or breakfast at the hotel. Once your child finds their room, meets their roommate, is introduced to their RA and their classmates on their hall…their new life has begun. Try to remember, through the quivering lip and the boulder in your throat that even if it doesn’t feel that way, this is one of our finest parenting moments.